Tens of thousands of people are attending the funeral of Rafael Ramos, one of the two New York policemen shot dead a week ago. VP Joe Biden praised the “finest police department in the world” at the service, attended by police forces from across the US and Canada. Rafael Ramos and Wenjian Liu were shot after weeks of anti-police protests. Police at the funeral again snubbed New York Mayor Bill de Blasio, who appeared to back some of the protests. 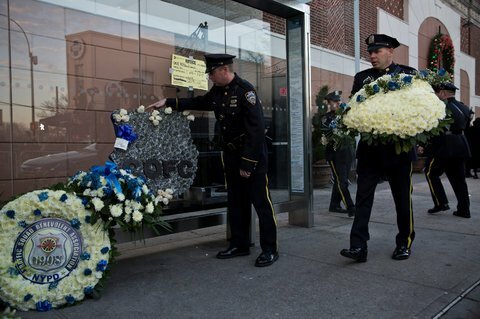 Funeral details for Officer Wenjian Liu have yet to be announced. Telling the mourners Officer Rafael Ramos had been a “hero”, Police Commissioner Bill Bratton announced he had promoted both officers posthumously to Detective First Grade. New York Governor Andrew Cuomo also paid tribute to the dead officer as well as to the New York Police Department (NYPD). “To the Ramos family, we’re all lucky to have Rafael,” VP Joe Biden told the congregation at the Christ Tabernacle Church in Queens. Rafael Ramos, 40, had been studying to become a police chaplain and was described as “a man of great faith” by a pastor who knew him.